The big sign at the Coop Gas Bar said, “Congratulations Joe K! Joe who, and why is he being congratulated, I wondered. Then I find out Joe K. is the quiet, polite guy who has been serving me diesel fuel for years. You see a person hundreds of times at a certain place, going through the motions and particular social exchanges of that place, and you know no more about them than the first time you ever saw them. So I thought, let’s find out who this Joe K. guy is when he’s not pumping gas, and was pleased when he agreed to be interviewed. Some people don’t. Joe lives alone in a nice house built, he said, by Shorty Craig. Throughout the time we talked, Joe was kind of jumpy, and it was clear he was a deeply shy and modest man. We sat in his living room, surrounded by plants and hundreds of mementos of Joe Kranabetter’s passion: 5-pin bowling. But more about that later. Like most of us, Joe is from somewhere else; in his case Creston, bc, a small town in the Kootenays, near Nelson. The back fence, he said, was the border of Idaho. Third of eleven kids in a farming family, he was driving a tractor by the time he was 10, helping with the hay, some beef cattle, the orchard and the family vegetable garden. Joe loved machinery, so apprenticed for five years as a machinist, but deeply religious feelings drew him to serve in a religious order of the Oblate Brothers of Mary Immaculate. The Order sent him first to Ottawa for two years, and then to Tofino. Here he worked for five years as a child care worker at Christie Residential School at Kakawis on Meares Island. His spiritual quest for personal growth satisfied, Joe spent the next seventeen years fishing for salmon in Clayoquot Sound with his own boat, the Sinaway. Switch gears again. Joe left the sea and became involved with fixit Motors, a gas station that used to be near Weigh West. When fixit closed six years later, Joe started with the Coop Gas Bar. When you’re in Joe Kranabetter’s house, it takes two seconds to realize the guy is a serious bowler. When we get around to the details of the subject, Joe is on his feet leading me around the house. It’s show and tell time, and there’s an extraordinary amount of bowling history under Joe’s roof on every shelf, surface nook and cranny—a dusting nightmare if one cared to be conscientious. Joe’s shyness, but never his modesty, falls away as he tells me about the world of bowling tournaments. The fact that he’s good is evident in the trophies, plaques, medals, badges, and commemorative plates that declare that Joe Kranabetter is a bowling champ. Three time provincial champion in 1994, 2003, and 2005. Four times he’s appeared on tsn, a tv sports channel. “Winning the men’s competition on tv was quite exciting,” Joe admits, an understatement for sure. Joe digs up the video clip of the winning game. As we watch, Joe’s body language shows him re-living the game through every muscle. He admits to feeling nervous just watching it. Joe’s style is not flashy or eccentric; it’s measured and steady—just like Joe himself. When he is declared the winner, the on-screen Joe raises both arms in the air in a victory gesture and beams with pleasure. Victory sometimes brings rewards other than trophies and plaques. The tsn victory earned Joe $300 bucks per frame, plus a winner’s bonus of $1500. “Have you ever bowled a perfect game,” I ask. The answer is provided modestly. “Once. 12 strikes. No opens. February 1993.” Joe never says more than he has to. There are other things that have interested Joe Kranabetter in his life. A glass ball collection, for instance. He’s got 234, but hasn’t gone out in storms looking for more in twenty years. And he’s a reader. Open on the coffee table is eighty years in tofino by Walter Guppy, and right next to it, the tofino kid, by Walter's brother, Anthony Guppy. Still deeply religious, he attends church and church socials regularly. But bowling is never far off Joe’s mind. He bowled in eleven major tournaments in 2004. He bowls in Nanaimo every Tuesday. Just before this article was published, Joe went to Vancouver to compete against 60 of bc’s best bowlers to qualify for Bowl bc’s cbc Championship 5 Pin Bowling Series. Only one would win. Wouldn’t you know it! That one was no one else but Joe Kranabetter. Congratulations, Joe! The tournament itself will be taped in the fall, and Joe K. will appear on tv again doing his stuff sometime this coming winter. We know who we’re rooting for, don’t we? Shirley Langer describes herself as a woman about town with a well developed civic consciousness. 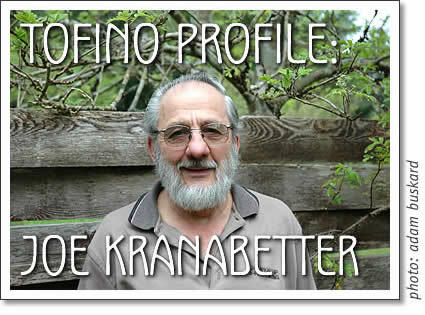 Tofino profile of Joe Kranabetter, written by Tofino writer Shirley Langer for Tofino Time Magazine in May 2005.